This tab contains settings from the nms.ini configuration file stored in the ProgramData folder (it is in “C:\ProgramData\IPHost Network Monitor\” if the OS is Windows Vista or newer or in “C:\Documents and Settings\All Users\Application Data\IPHost Network	Monitor\” if the OS is Windows 2003). You can edit this file directly when neither the monitoring client nor service is running. The settings cannot be edited directly from the client GUI, since it will involve restarting the monitoring service and/or client and/or database. Do not change these settings unless absolutely necessary. Network Monitor Service – is the Host where the monitoring service runs (read only) and TCP Port used to communicate with the service (3056 by default). Database Server – is a Host (read only), Port (3055 by default), a path to the monitoring database file on the host or a Firebird alias for it, database user credentials, and a path to the Firebird database server binary. 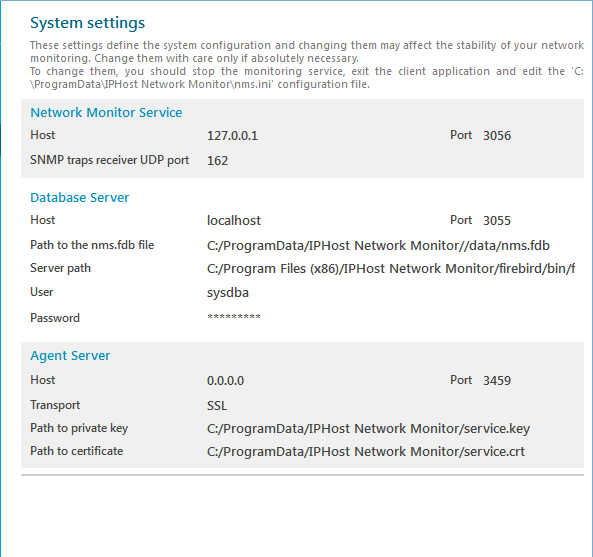 Agent Server – is a Host name and Port an Active Remote Network Agent will use to connect to the monitoring service. Also, the path to self signed certificate and secret key files is included here. 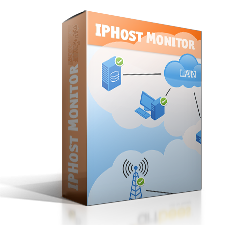 These keys are used to establish an SSL protected connection between the main IPHost Network Monitor service and Remote Network Agents.